With space for up to 2,600 patrons, seating in the Saenger theatre is split over just two levels – the Orchestra floor, and the Balcony, allowing for unrestricted views to the stage from every seat. Wheelchair and mobility scooter accessible seating is available for all patrons requiring accessible seating – this option must be specifically selected when you book your seats. Please ensure that you find your way to the correct pre-allocated seat as booked online, as not adhering to this will cause confusion for other theatre-goers, particularly in heavily attended shows. 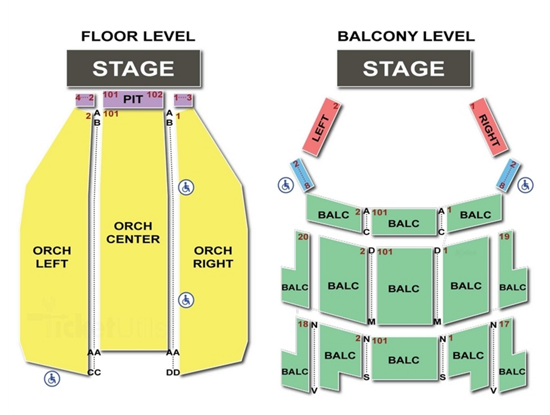 Seating is easy to navigate, and stewards will be readily available to help guide you to the correct seat. Once seated, patrons are asked to remain in their seats until the interval or end of a performance. If you must leave for any reason, please do as quietly and discreetly as possible to minimise the disruption of the performance for others.